SUPERB LUXURY STUDIO IN ASSOS-Stunning bay views -2 min to beach & tavernas! Property 7: SUPERB LUXURY STUDIO IN ASSOS-Stunning bay views -2 min to beach & tavernas! Dina Apartment: House on the beach of Kaminaki! Air-conditioned and with big private terrace. 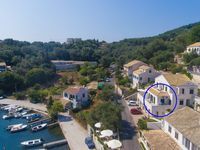 Property 8: Dina Apartment: House on the beach of Kaminaki! Air-conditioned and with big private terrace. Stay at our peaceful, family run beachside studios enjoying fabulous sunsets! Property 9: Stay at our peaceful, family run beachside studios enjoying fabulous sunsets! Tasos Villas - No 2. Single villa with private decked seating area. Property 36: Tasos Villas - No 2. Single villa with private decked seating area. Property 48: THE MAYFLOWER STUDIOS - EVERYTHING YOU NEED FOR A RELAXING HOLIDAY ! Everything was good, the host is welcoming and hospitable. Everything was good, the host is welcoming and hospitable. The apartment was exactly as in the photos, great view from balcony.